On December 4th, 1997, the statue of Bill Shankly, created from bronze by Liverpool artist Tom Murphy, was unveiled at the new Visitor's Center in front of the Kop at Anfield. 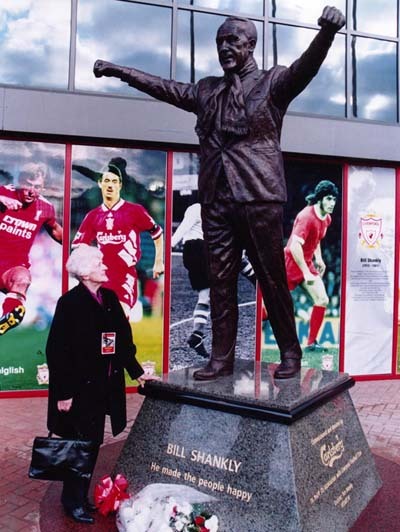 Standing at over 8 feet tall, Murphy's creation shows Shankly in familiar pose, taking applause from adoring fans and wearing a fan's scarf around his neck. The pose, chosen specifically by Murphy, is a representation of the time, in 1973, when Shankly and his team were parading the League Championship trophy in front of the Kop. A young supporter tossed his scarf onto the pitch in front of Shankly and an over-eager policeman kicked it away before being admonished by the great man. "It's only a scarf to you, but it's the boy's life." Shankly then picked up the scarf and tied it round his neck. Murphy studied videos and photographs and spoke with Bill's widow Nessie, ex-Liverpool players, and even Bill's former tailor before starting work on the sculpture which weighs in at three quarters of a ton and stands handsomely on a four sided plinth made from red Scots granite. The statue was commissioned and financed by the club sponsors, Carlsberg. Tom Murphy said, "I wanted to make the statue look like a living thing. The pose I chose is one people will immediately recognise - arms straight out and triumphant, saluting victory before his adoring fans." "There is not enough time in the world to talk about the contribution Bill made to Liverpool Football Club. It is all very well for managers to take over clubs when they are doing well, when all the structures for success are already there, but when Bill came here the whole thing was falling apart - the team and the stands. He took this place by the throat and made it great." A miniature version of the statue was presented to Bill's widow, Nessie after the day's events. 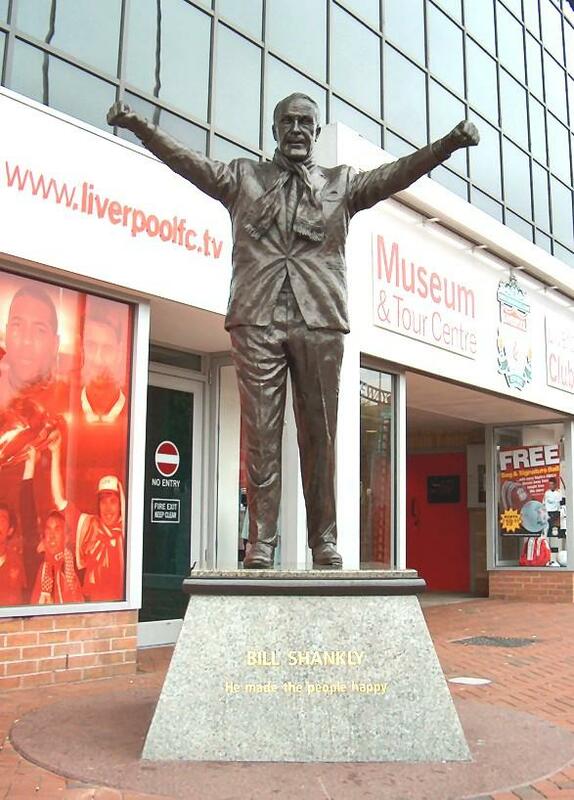 "Shanks was always about the people, and this statue sums that up. The legend and foundations were laid in stone by Shanks, it is close to the United game but people don't need reminding of what this club means and what Shankly means to it. There were other people who did their bit, but Shanks was the football man, the front man and he was fantastic at it. He was an inspiration, and my inspiration. My other inspirations were Joe Fagan and Bob Paisley, they were fantastic themselves in different ways. Shanks would have handled it in the modern game, although he might not have been too happy with what goes on now. He went several years without winning anything major, and if he had been around today the pressures on him would have been like they are on all of us. He wouldn't have liked the involvement of so much media or so much money, but the game has moved that way, financial through the media, and he would have had to accept it." Players past and present were at the ceremony. As well as Yeats, Tommy Lawrence, Chris Lawler, Gerry Byrne, Willie Stevenson, Ian Callaghan, Roger Hunt, Ian St. John and Peter Thompson, from Shanks's great 1960s side queued up to pay tribute. On the accompanying picture you can see Nessie Shankly showing her appreciation of the statue at the unveiling ceremony. 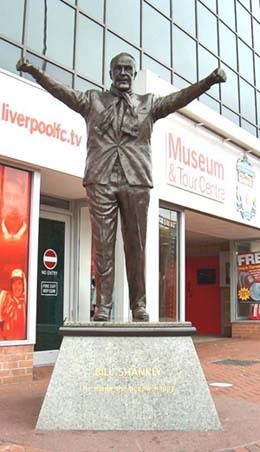 Callaghan, holder of the club's appearances record with 848, said: "I know we have had the Shankly Gates for some time but this statue is something that had to be done because he is the greatest single influence on this club's history. I came here as an amateur the year before he became manager so it was him who convinced my mum and dad that I should be a professional player. I regarded him as a father figure and he started everything off for me and for the club. Liverpool is what it is today because of him." Players from the 70s and 80s also turned out in force. Phil Tompson, Alan Kennedy, David Fairclough, Kevin McDonald, Peter Cormack, Ronnie Whelan, David Johnson, Steve Heighway and Brian Hall were joined by members of Bill's family and friends, some invited down from Ayrshire, and old ex-teammate from his Preston North End days and managerial rival from the 70s, Tommy Docherty. "Following a game against Southampton at Anfield, a young reporter from the Southern Evening Echo collared Shanks to ask him what he thought about a young Southampton winger called Mick Channon. Shanks was polite and told the reporter he thought the young Channon was a very good winger indeed. 'Would you say he's as good a player as Stan Matthews?' the reporter asked. 'Oh, aye,' Shankly said earnestly. 'As a player he's definitely on par with Stan Matthews.' The reporter thanked Shanks for his time and turned away, scribbling the quote into his notebook. Suddenly, Shanks reached out and caught the young man by the arm. 'This Channon is as good a player as Stan Matthews,' he said, 'but what you have to remember is that Stan is sixty-five now.'"